In a 30cm frypan heat 2tsp olive oil on low to medium heat. Add sliced onions, season and cook until they start to soften. Add the diced red capsicum and cook until translucent. Add the Kale and parsley and water and cook for 2 minutes until the water reduces and Kale reduces in size. Set aside. Put the remaining oil in the pan and cook the chorizo slices until golden brown. Add the onion. Kale and capsicum back into the pan and reduce the heat to low..
Take off the heat. This dish can be served warm or cold. Having used spinach and silverbeet in many recipes in the past I thought that Kale would be very similar. It wasn’t until I started preparing my ingredients that I realized that kale was much more dense and would need to be cooked first before eating. I cut out most of the hard stalks then finely chopped the silverbeet sautéing it with the onions and capsicums. It doesn’t release moisture like spinach does and holds it’s shape really well. I wanted to keep the recipe as simple as possible, so what better way than to use chorizo with the leftover chorizo oils to flavor this dish with a good squeeze of lemon. 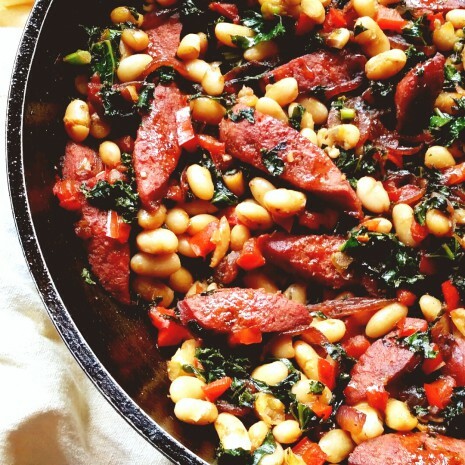 Cannellini beans were added at the end to hold their texture and were the perfect companion for the Kale and Chorizo. Yumminess in every bite! I like serving this with an egg with just a little ooze in the yolk and crusty sourdough bread. Naturally on it’s own is a dish in itself too.